When I wrote about the YMAL concept (You May Also Like…) and pigeonholing your own book, I was flummoxed that I could no longer find the term “You May Also Like…” on Amazon et al. I figured that (a) either I’d heard a similar term and flubbed it to make it my own or (b) I was going crazy and it never existed in the first place. I’m not sure that it’s worth putting the author’s own books as YMALs — even as a selling strategy for the bookstore, you have to think that people are already likely to buy that author’s other books, and therefore pushing other authors the reader may not know would be the better approach. 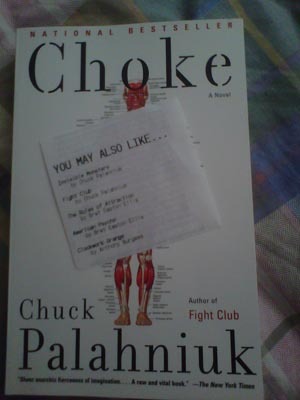 This entry was posted in Wordless Wednesday and tagged a few strong words, Choke, Chuck Palahniuk, Fight Club, Graham Strong, novel writing blog, YMAL, You May Also Like. Bookmark the permalink.